Tips for creating multisampled instruments in BM3. Please add more tips & tricks below. Thanks. 1. Easiest method may be to analyze one of the melodic instruments in the stock BM3 library. 2. Key-Mapping: 'Root-Key' (aka key center or key index) is the sample's root pitch. 3. Key-Mapping: 'Key-Range' is the Lowest-key and the Highest-key that the sample should play. 5. It's a balancing act: recording each key/fret would be ideal, but the work involved in mapping all of those samples is very time-consuming, and more samples takes up more system resources, like RAM, disk space, & CPU. All of which the iPad is way behind when compared to a computer. Luckily BM3 has Disk Streaming, which significantly lowers RAM/memory usage, since the iPad has a fast flash-based drive (like an SSD), but also has limited RAM/memory. 7. Sometimes samples with be 'Key-Labeled', meaning that they will have the root-key in the file name (i.e. - "Piano C3.wav"). Or possibly it may be in the MIDI Note Number format (i.e. - "Piano 060.wav"). 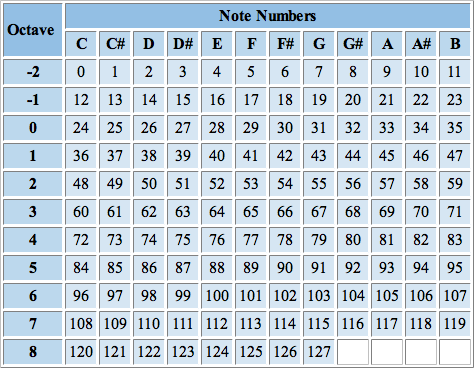 Below is a convertor for MIDI Note Number to Key. 8. Multiple Layers: Under Construction. This adds to the realism and complexity of the instrument. It's also useful for sorting samples that are too loud or quiet, or have a different timbre. Layer string samples with piano samples for the classic Piano+Legato Strings patches. Or layer different drum samples for maximum impact. Or for sound effects, soundscapes, pads, etc. 9. Sample Looping: Under Construction. This is probably the most time-consuming and frustrating process. This is used so that the sample sustains while using an ADSR envelope. If you hold a key down for a long time, the samples sustains or continues to play inside the loop. MONO samples are significantly easier to loop than STEREO samples! That's because with STEREO, there are two waveforms - a left & a right, and those waveforms are almost never identical! It's easy to get clicks & pops were the loop starts and ends (aka 'Loop-points'). Use 'Zero Snap' to find where the waveform crosses 0 (basically silence) to help with setting loop start & loop end points. BM3 has 'Crossfade looping', which helps immensely if you still get clicks & pops at the loop-points, but you will need to turn off Disk Streaming to use this feature. Crossfade looping is sometimes the only option for stereo samples. 10. Modulations: Under Construction. BM3 has an impressive modulation section, and this can help liven-up a sound, making it more complex and interesting. Put a slow tempo-synced LFO on the filter cutoff, for example. Set a MIDI CC to modulate the Amp Envelope's Decay Time on Snares & Hi Hats. Use small amounts of Random, S&H. or the Step Modulator to modulate the pitch, etc. The Step Modulator can run in FREE Mode or PITCH (Chromatic) Mode. The LFOs can reset at note-start (Mode=MONO) or free-running (Mode=POLY). Plus most modulation sources can be synced to the tempo of your Session. And a modulation destination can have multiple sources. 5pinlink's Tip: ...using velocity to change attack and filter, it saves a ton of extra velocity layers, the piano gets softer the lower the velocity and brighter and harder the higher velocity. Here are a few demo Bank Presets to learn from, improve, & re-share. These are zipped *.bmk3 Bank Presets with their associated 16bit 44.1kHz WAV samples. @MSandoval great stuff! Thanks for sharing and educating! This is ace ! Thanks @MSandoval !